Excel Pivot Table Tutorial Part 1 - What is a Pivot Table in Excel? The average of a data column, broken down into data types. The spreadsheet below lists every sale that was made by a company during the first quarter of 2016. The spreadsheet records the sale date, the invoice reference, the invoice total, the name of the sales representative, and the sales region. An Excel pivot table can summarise the data in the above spreadsheet for easy analysis. For example, the above pivot table on the right shows the total sum of all sales, for each of the four sales people. A more complex pivot table is shown below. In this pivot table, the sales totals are broken down by month for each sales person. The sales totals for each area are also shown. A further feature of Excel pivot tables is the ability to quickly extract the data from any part of the pivot table. 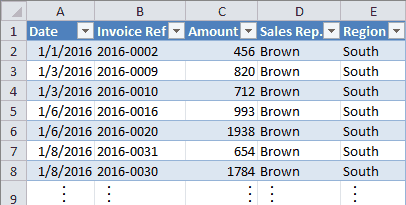 For example, if you wanted to see a list of Brown's sales during January 2016, you would simply use the mouse to double click on the cell showing this value (the value $28,741 in the above example Pivot Table). Excel then creates the new worksheet (shown below), listing Brown's sales during January 2016. For the time being, don't worry about how the above pivot tables are produced. This section of the tutorial simply aims to answer the question "What is a Pivot Table in Excel?". We will learn how to create these pivot tables in the following sections of this tutorial.